Supported Swedish and Portuguese language. 2018.01.28 1.4 Supported French, German and Spanish language. 2013.01.24 Overlapped effect bug fixed. 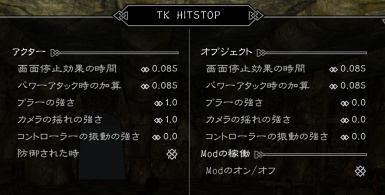 2013.01.20 Object Hit Stop added. 2013.01.13 HitStop applied to unarmed attacks including for werewolves and vampire lords. 2012.09.11 Left hand attack bug fixed. 2012.09.10 Slow time shout bug fixed. 2012.09.08 Shake Contoller and PowerAttack Time added. 2012.09.04 Attacks stuck in slow motion bug fixed. 2012.09.03 0.0 Release Preview version. 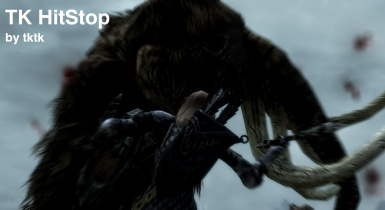 Hit Stop : Simulates a pause in the movement of the player and the enemy. Default: 0.08 seconds. PowerAttack Time : Adds additional time to the hit stop, camera shake, and controller vibration when hit by a power attack. Default: 0.08 seconds. Blur Effect : Applies radial blur to the player’s camera. Default: 1.0. Shake Controller : Vibrates the controller. Default: Off. 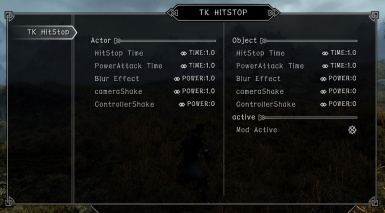 If this mod does not work correctly, please save a game, and then load it again.